An impressive antique 6.56 carat amethyst and seed pearl, 15k yellow gold pendant with 18k yellow gold chain; part of our antique jewellery collections. This fine and impressive antique amethyst pendant has been crafted in 15k yellow gold, with an 18k yellow gold chain. The oval mount displays a feature oval mixed cut amethyst, claw set to the centre of the design. The amethyst is surrounded by twenty one individually claw set seed pearls. The pendant suspends from an 18ct yellow gold cordina style chain via a shaped ring loop attachment, ornamented with seed pearls. The cordina style chain secures with a conventional spring loaded bolt fastening to the reverse, hallmarked with the 18k gold finess mark. This impressive example of 1980's gemstone pendant is fitted to the original leatherette hinged presentation case, securing with a push fit catch. The velvet and satin lined interior displays the retailer's mark 'Allen & Daws, Art Jewellers & Diamond Merchants, Norwich'. The pendant is supplied with an independent diamond grading report card. Images do not always reflect the true colour and brilliance of gemstones and diamonds. The video however provides a truer representation of the actual colour and showcases each stone. Condition This stunning antique amethyst and pearl boxed pendant is exceptional quality set with an impressive amethyst and pearls. The pendant is an exceptional gauge of gold and is in excellent condition, hallmarked to the clasp of the chain. Reflections in photographs may detract from the true representation of this fine example of antique jewellery/estate jewelry. Amethyst Quality Colour Purple Cut Oval Content 6.56 carats Dimensions 12.89mm x 10.22mm x 7.39mm Dimensions Length of drop 2.76cm/1.09" Width of pendant 1.531cm/0.6" Chain length 38.1cm/15" Date: Circa 1890 Video: A video of this fine piece is available upon request. 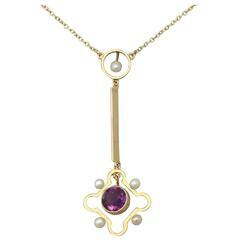 This stunning antique amethyst and pearl boxed pendant is exceptional quality set with an impressive amethyst and pearls. The pendant is an exceptional gauge of gold and is in excellent condition, hallmarked to the clasp of the chain.